Click Here for more Old Photos! Click Here for more recent Photos! The Richardson Ranch was pre-empted in 1903 by Mexican Tom Hodges. Tom stretched his money too thin in establishing his dream ranch and lost it to his creditor in 1908 when it was sold to the Walsh Brothers. In just ten years these Montana cattlemen built a thriving cattle ranch, including large barns, silos and ranch residence (still in use today). Eric Richardson purchased the ranch in 1919 with the help of the Soldiers Settlement Board. He arrived from Vermilion, Alberta via the Grand Trunk Railway and Prince Rupert with his mother, his brother Ken, and his 13 year old son, Francis Richardson. Eric was a bookkeeper by trade so most of the farming fell to Francis and Ken. Beef was sold fresh and canned to local markets. In 1952 Doug Richardson, Francis’s oldest son , with wife Alice, took over the ranch. They initially sold fresh beef, door to door, until power and deep freezers allowed them to sell by the side cut and wrapped. In the early sixties Doug and Alice were butchering over 40 yearlings a year. Changes in demographics and range laws meant the cattle had to stay home on our 240 acres so the herd was reduced to only 12 cows in the early seventies. In 1980, Doug’s oldest son, Don, returned to the ranch to establish a Veterinary Hospital. 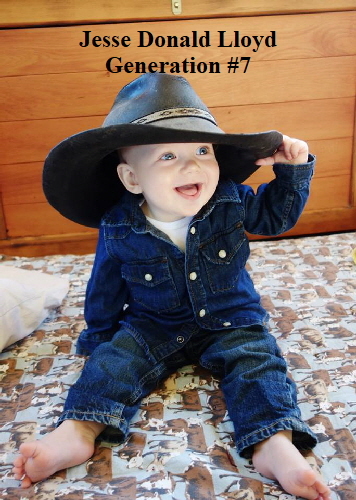 He and Doug started a partnership to modernize and rebuild the cattle ranch. They used ROP and an extensive AI crossbreeding program to increase weaning weights of the commercial calves from 425 lb. to over 650 lb. in less than 10 years. Attention to pasture management, fertilization and lots of cross fencing allows us to carry thirty cow calf pairs plus replacements as well as put up a grass silage to winter the cattle. A new BC Ferry service came to the Queen Charlotte Islands in 1982 allowing easier and reliable travel to the mainland. 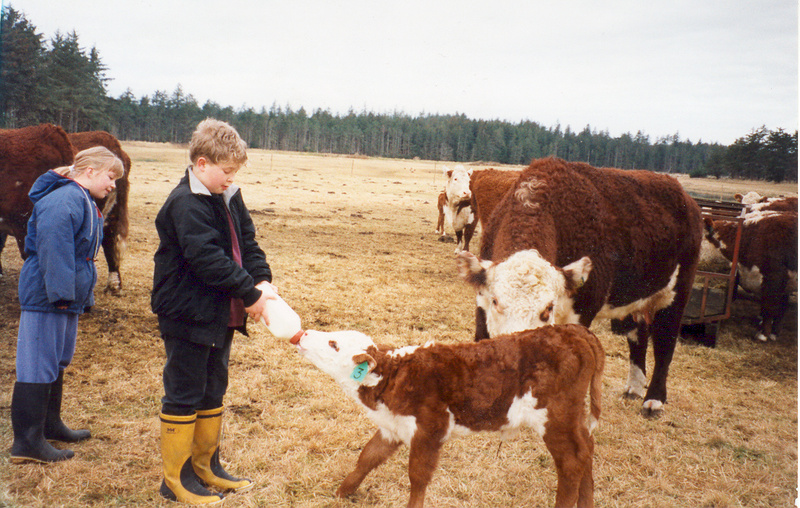 Don purchased his first purebreds that year from Joe Utz, founding member of the Yellowhead Hereford Breeders Club. Don joined the club and attended its first female sale in Vanderhoof where he added more females. In 1985 Don attended the Ponderosa Sale in Maidstone, Sask. where he bought 5 bred heifers which would play major contributions in building a purebred herd. Some ET work was tried with purchased embryos and and extensive AI program was followed. Don again went to the prairies to attend the Kilmorlie dispersal sale where he and wife Leslie bought 6 great females and then they returned for the Saddle Valley Dispersal. The last commercial cow left the herd that year ending cow families which could be traced back to 1919. The first Richardson bull was sold in 1986 at the Vanderhoof All Breeds Bull Sale and 2012 was our 27th annual consignment to that sale. We also started showing our cattle at the Bulkley Valley Exhibition at Smithers each year believing that it is necessary to show cattlemen the type of cattle we have at home so they will be confident in buying our bulls. 2005 was our 21st trip to this fair. Recently Tlell Polled Herefords have been showing at Farmfair International in Edmonton. Going to Farmfair and Smithers on alternate years was the plan but in 2012 a trip the Olds, Alberta to show at the 16th World Hereford Conference was the big show for the year. An Annual Online Sale was started in 2010 and has proved to be a successful alternative to consignment sales to sell the females. This is purely an electronic venture using the internet and social media to get the word out. There is no printed catalogue and LiveAuctions.TV is the service provider. In 2012 Jamie Richardson, Don & Leslie’s daughter, returned to work on the ranch in Tlell with her partner Bill Lloyd. After five years in Alberta attending Olds college and working in the feedlot industry and managing ranches in both Hardisty and Cold Lake she decided it was time to come home to begin the succession to a new generation. This is a family farm with Polled Hereford cattle, a complete Veterinary Hospital with boarding kennels and a Feed & Pet Store. 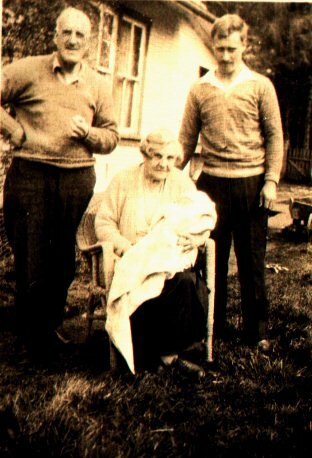 Dane and Jamie, pictured above are the sixth generations of Richardsons to live at Tlell. Jamie & Bill’s son Jesse was born June 14, 2015. He is generation number seven!